"The must have shoe for fall and winter is the wing tip? Why is that? "Of course, fashion magazines are touting them, but it is perhaps a return back to the tried and true amidst all the uncertainty out there right now. 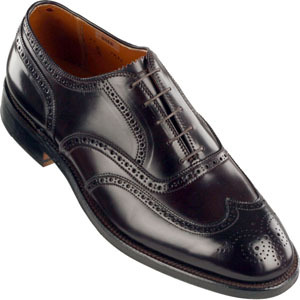 While not always seen as the hottest trend, wing tips have seldom been seen as inaprorpiate. With the trends being for the past few years to be “dressed down,” sometimes to the extreme, even a small wing tip detail in a more casual color shows that a guy cared just a little bit. "While the well polished wing tip is a classic, distressed, worn in wing tips are being shown on the run way." N.A. "New Shoes - The Wing Tip". VintageGent Menswear Daily. 22 October 2008. Web. 6 January 2011.